This is a 9 percent increase from the $215 billion deficit reported in February 2018, and a considerable downturn from the $9 billion surplus reported in January. The next largest monthly deficit occurred in February 2012, when it reached $232 billion. Tyler Evilsizer, deputy policy director at the Committee for a Responsible Federal Budget, cautioned against reading too much into a single month of data. Evilsizer said that annual deficits are more relevant. 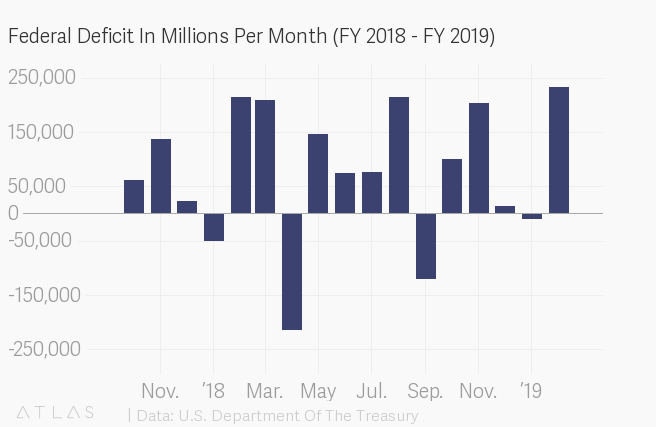 Through the first five months of FY 2019, the annual deficit stands at $544 billion, a 39 percent increase from where it was at the same point during the previous fiscal year. The Congressional Budget Office (CBO) projects a $897 billion deficit for the entire fiscal year. On a 12-month rolling basis, the figure is up 32 percent as Rattner states in his tweet. If the CBO projection proves to be accurate, the FY 2019 deficit will be 15 percent higher than the $779 billion deficit in FY 2018. Economic experts attribute the growing deficit to a combination of tax cuts and spending increases. In December 2017, President Donald Trump signed into law the Tax Cuts and Jobs Act, a tax cut package that, among other provisions, reduced the corporate income tax rate from 35 percent to 21 percent. An analysis by the Joint Committee on Taxation found that the legislation would increase the deficit by more than $1 trillion over 10 years. The Trump administration has previously argued that the lost revenue will be counteracted by economic growth spurred on by the tax cuts. But as Rattner points out, this has yet to meaningfully happen. “Clearly we’re still waiting for the tax cut to pay for itself – revenues are running down nearly 1% Y/Y while spending is up 5%,” reads the second half of his tweet. Treasury Department figures confirm Rattner’s statement, calculated on a 12-month rolling basis. “Aside from the aftermath of the Great Recession, 2019 is on track to be the largest federal deficit ever, due to the aging of the population, as well as recent tax cuts and spending increases,” Shai Akabas, the economic policy director at the Bipartisan Policy Center, told TheDCNF in an email. 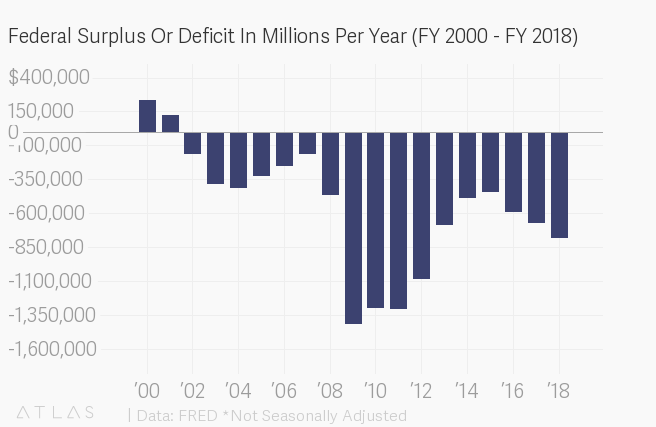 “The record February deficit is the result of this, and some degree of random fluctuation, but more importantly, it is reflective of our unsustainable fiscal path. Congress and the president need to stop piling debt onto the next generation of Americans and instead act to put our fiscal house in order,” he continued. The federal debt recently surpassed $22 trillion, and the CBO projects it will reach $23.5 trillion by 2020.